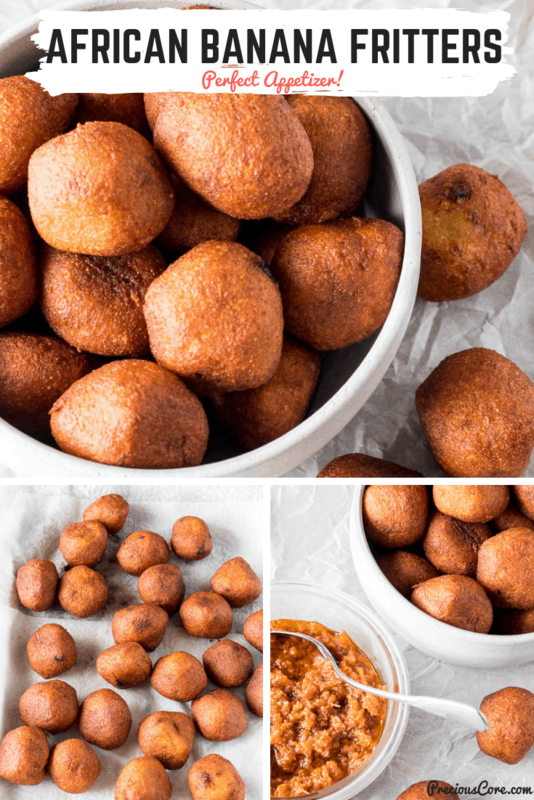 Accra Banana – crunchy on the outside, soft on the inside sweet and salty chewy balls of goodness that taste like home to me. 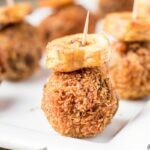 These African Banana Fritters are to die for! 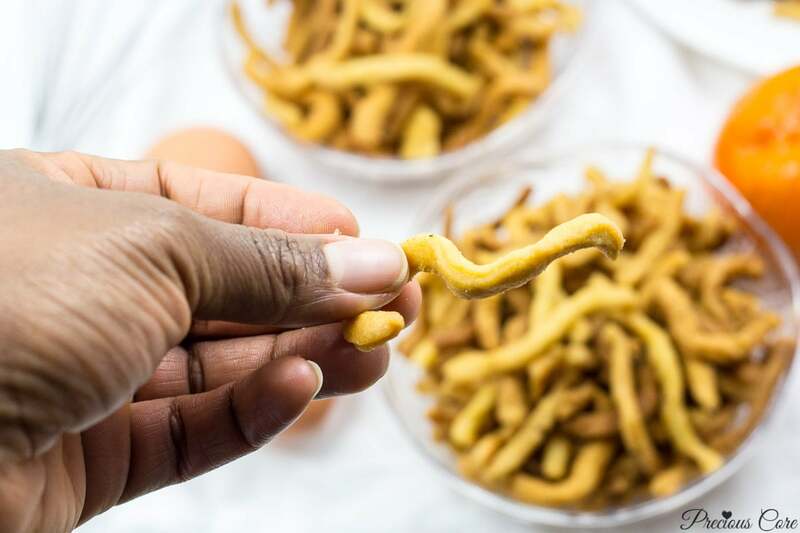 Many years ago in my primary school days, I would buy Accra Banana with the little allowance my parents gave me during breaktime to snack on. It was in those days that my taste buds developed a love for this snack made out of banana and cassava (yucca root). Many years later, I am still enjoying Accra Banana. This time, I no longer buy it from the dining shed in school but I make it in the comfort of my own kitchen. 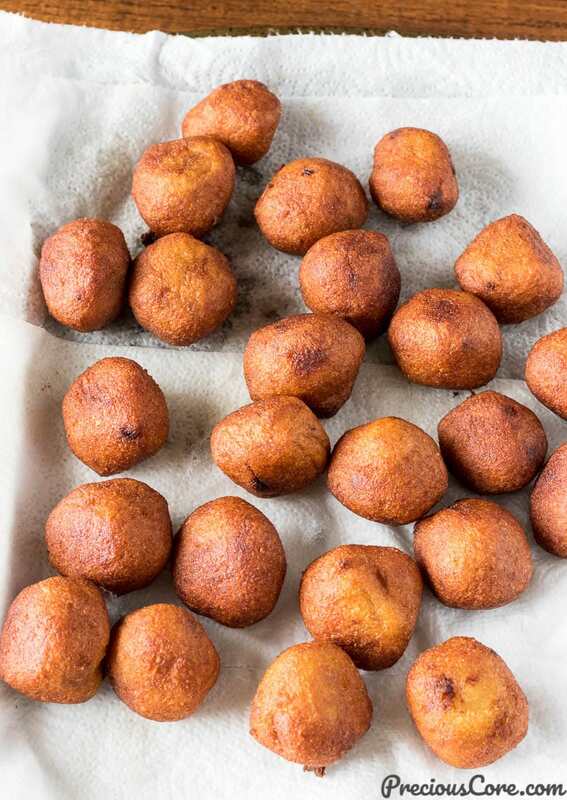 Accra Banana is basically African Banana Fritters. 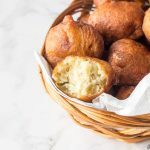 These fritters are made in different ways across the continent but the principle for making them remains the same. 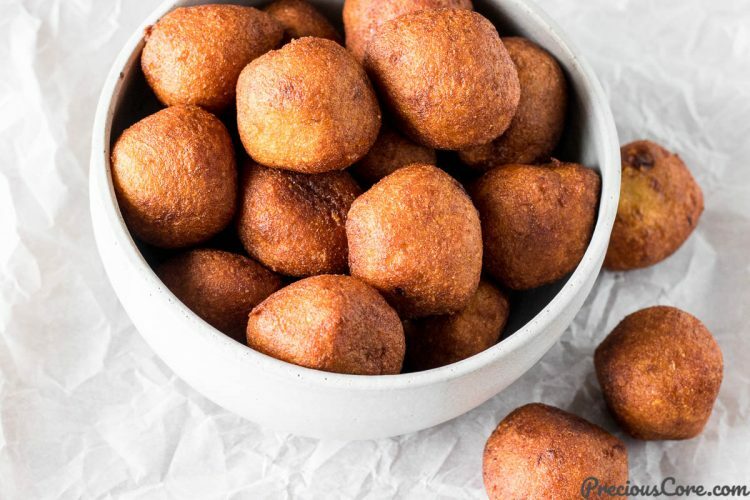 You mix mashed bananas with some form of starch then you divide the mixture into small portions and deep fry. 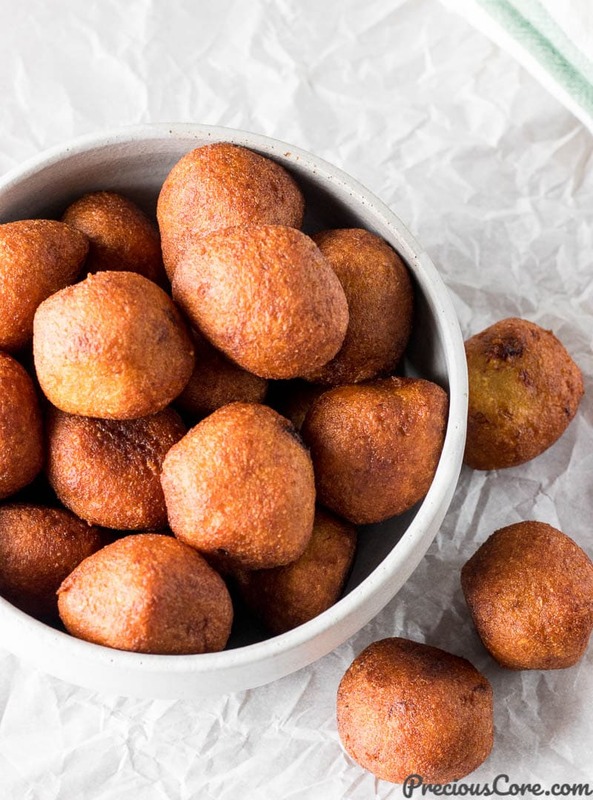 The starch used varies and could be regular flour, rice flour, cornmeal or in this case, cassava. In Cameroon, cassava is used in various forms. 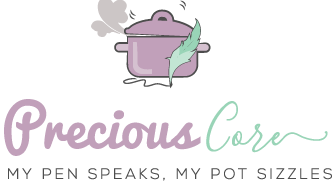 It is used to make fufu (a dough-like starchy side dish eaten with soups), garri (granules made out of cassava), bobolo ( cassava sticks) and more. And of course, it is used to make Accra Banana, which is also called Accra Cassava. To make the Accra Banana, the cassava is grated then mixed with mashed/pounded banana. To make the process easier, I purchased already grated cassava from an Asian store. I bought it frozen and allowed it to thaw at room temperature. Apparently, Asians have many uses for grated cassava just like West Africans. The food fusion in the world is amazing! 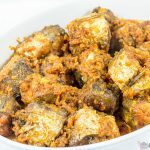 Admittedly, I have made Accra Banana many times from scratch, peeling and grating the cassava myself either with a handheld grater or grinding the cassava in a food processor. You can also grind the cassava in a blender if you have a powerful blender. I really love my Ninja Blender because it gets tough grinding jobs done. 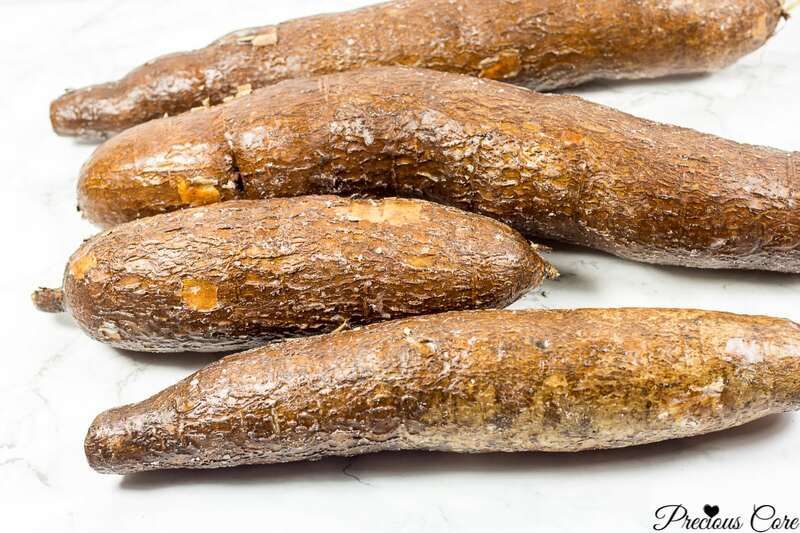 You will have to add a little water to the cassava though but that’s still pretty good for a blender to transform such a hard tuber into a paste! Also, sometimes I go the shorter route by just using garri and banana to make my Accra Banana. That’s because garri is basically granules made out of cassava. So it is still banana and cassava and the taste is amazing! You can check out the recipe for that here. I highly recommend you try it out if you do not have the time to make grated cassava happen or if you can’t find already grated cassava. You can purchase garri from African stores, the African aisle of Asian stores or from Amazon . I love serving Accra Banana with this African Pepper Sauce (hot sauce). 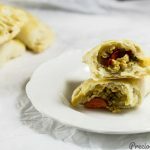 It makes for a great appetizer or snack! Sometimes, I’ll just have it with tea or coffee instead. Such a tasty chewy, sweet and salty snack! I made a video to walk you through the process of making your own Accra Banana. Watch the video, get the ingredients and GO MAKE SOME. You’ll be glad you did! Accra Banana is basically African Banana Fritters - Bananas combined with grated cassava (yucca root) then fried. The result is crunchy-on-the-outside, tender-on-the-inside balls of perfection that are to die for. The perfect appetizer, snack, party food or accompaniment to your tea or coffee. Check out the recipe video above to see how I make it. Peel bananas and place in a bowl. Mash with a wooden spoon or potato masher to form a paste. Add grated cassava, garri (or cornmeal) and salt to the mashed bananas. Mix well to combine. Place oil in a frying pan or pot up to 3 or 4 inches. Heat up for about 8 minutes on high heat to 350 degrees Fahrenheit (180 degrees Celsius). Take about a tablespoon of the mixture and form a ball about 1 inch in size. Gently place the ball in the oil. Continue forming more balls and placing in the oil until there are enough balls to cook in the oil (but not overcrowded). Let them cook for about ten minutes while you stir from time to time. Take the Accra Banana out of the oil when it is a deep golden brown color. Place on paper towels to absorb the excess oil. Repeat the forming of balls and frying process with the rest of the mixture. Note: see the video to get a better picture of how to do this. 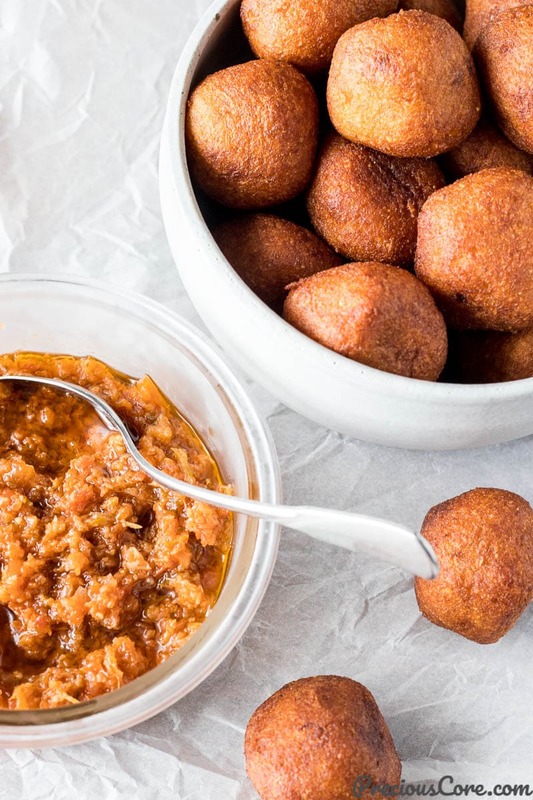 Serve the Accra Banana with African pepper sauce, tea or coffee. 1. It is best to use overripe bananas in this recipe as they yield the most flavor. However, if regular ripe bananas are all you've got then feel free to use them. 2. Here is the recipe for the African pepper sauce (hot sauce) that goes with Accra Banana. 3. You can purchase already grated cassava from the freezer section of Asian stores. It is sold in one pound packets. Allow to thaw at room temperature then you can use it. Hi Lucella, the one with grated cassava is so authentic! Thank you for stopping by and leaving a comment! 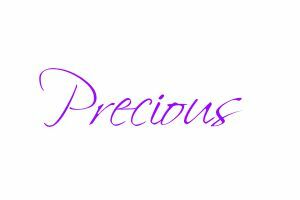 Hello Precious, I am so excited to find your blog. 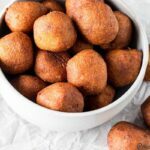 I live in Togo with my family and I have a hard time getting exact measurements from people for recipes. I wish I had the time to sit with the ladies and learn how they do it exactly. I am so happy that you have measurements and recipes. Thank you so much. I will be trying this recipe tomorrow and I will let you know how I like it. Amazing! I’ve been making something similar. Matter of fact, it was a coined out recipe from my leftovers and called it banana fritters. The kids love it but I felt I deceived them calling it what it’s not. Lol. Now, this is banana fritters. I could feel the crunch from here. We mamas know how to recycle leftovers. Lol. Thanks for your sweet words, dear. So glad to read from you.